What is your most memorable wildlife sighting? Indeed there are, Reeotch! I didn't know that until 2016, when I saw a couple in the Weminuche, in a swamp right next to the train tracks along the Animas. I think they were reintroduced there sometime in the 1990s. Damn, Reotch, a 6 legged moose! Damn, Reilly, learn to count. It's an 8-legged moose! about fifteen years ago, in a remote canyon near Jackson, my dog and I skied upon a moose giving birth. It was all I could do to restrain her as she sensed blood and vulnerability . I had to make a leash out of my scarf and hold on for dear life... Pretty cool. I saw an antelope giving birth BINTD of film. 96 or so .. Likely no longer have the slides..
Last night a pair of coyotes were howling up a storm in my front yard down here in northern New Mexico. Noisy, but very cool! Randy Grandstaff told a funny story about a wild burro sticking its head thru his open bedroom window while he was asleep and making him nearly piss the bed by braying loudly. Yesterday I had a beaver sighting! It was dragging a branch through the snow to it’s home in the creek. Made my day. I see bears, wild turkeys, mountain goats, etc. pretty regularly, but I can only remember seeing a beaver one other time in my life. Of course it was the day I didn’t bring a camera. We have a lots of Beavers here in VT. Just saw a short film @ Banf about how the west is so dried up because they killed all the beavers. I see their tracks in the winter. They love to belly slide down steep hills in the snow. Haha, I realized I have opened the door to beaver jokes. This is supposed to be good. I think it deals with that of which Tradman speaks. I've had several really memorable encounters. But the one which stands out the best was seeing the creature from the black lagoon. A friend and I were walking from Olmstead Point back into the woods to climb Creature From The Black Lagoon. As we came around a bend and saw the pond, we noticed something floating in the middle of the water. It looked about the size and shape of a small black backpack which a kid would use for school books. But it was moving. We got a little closer and realized that it was a bear's head. It was just taking a nice afternoon swim in the pond. We took a wide path around as we watched the bear play in the water. It dove several times, did rolls and somersaults, and looked like it was really enjoying itself. Seeing the bear just playing in the water on a hot summer day was perhaps the best wildlife encounter I had ever had! We tried to not bother the bear at all, and took a long, circuitous path to the top of the rock. Once up there, I looked over the edge, to see the bear from above. But it was gone. I guessed it must have left. So we started unpacking our packs and getting ready to climb. And then I noticed something move about 15 feet off to my side. A nice, dark, medium sized black bear was just topping out on the ramp to climbers' left. Almost within touching distance! He got up to the top, looked over at us for a few moments, and continued on his way. We just sat and watched the bear for about 20 minutes, as it took its time wandering up the hillside above the rock. It was picking at tree branches and leaves, and eating berries. And it didn't seem to care at all that we were right there with it. Definitely a super cool experience, getting to see the Creature From The Black Lagoon! GET BACK IN THE TRUCK! Reilly, I was in my 20s before I laid eyes on one of those strange creatures, hardly slept that night:) I saw my second one a few years ago at City of Rocks. Is that an antlion larvae? I think they’re called sand puppies around here. Idk wtf they are. Goats all over Utah mts. I've seen a couple of big cats up around The Needles, nowhere near a main trail or camp though. As a kid, stepdad and I paddled around the Boundary Waters a lot. On a river joining two lakes (a rare spot where we didn't have to portage,) we floated past a big old Moose standing along the shore. And the sound of them trumpeting at sunset echoing across the lakes is pretty cool. 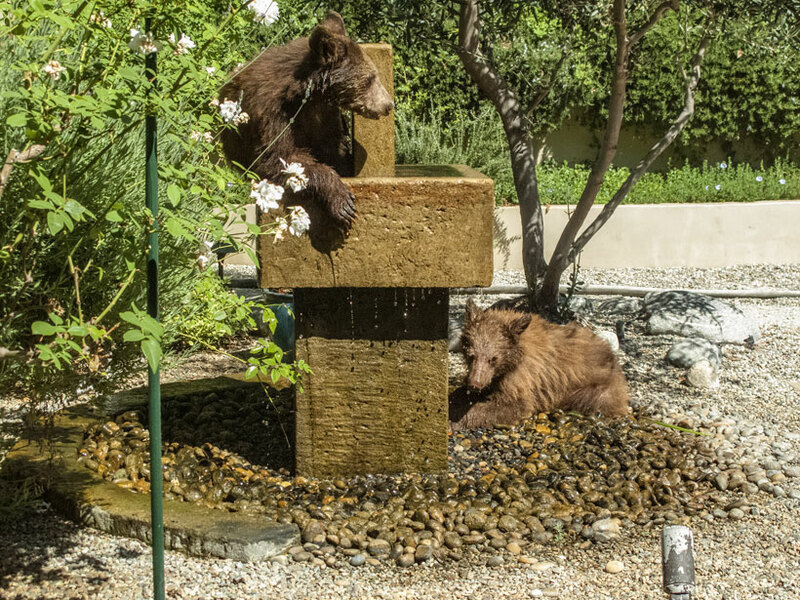 But one I just can't get out of my head is the two little bear cubs playing in my patio fountain. The bears around here live up in the Angeles Nat Forest, but I guess they are semi-urbanized. Once in a while they wander down to see what trouble they can find. Mostly they stay up on the mountain though.